Silver Spring, Md. — More than 100 firefighters from the Denver Fire Department responded to a blaze at an apartment construction site a mile from the Colorado State Capitol building, raising questions, yet again, according to the Build with Strength coalition, about the use of combustible materials in mid-rise residential housing projects. The three-alarm fire, which quickly consumed the entire structure that is now being considered a total loss, was slated to be a five-story apartment building with 84 units – built primarily with combustible wood-framing. A neighboring building was also damaged, and firefighters were also able to save four nearby buildings from significant damage. According to NBC 9 Denver, a total of 40 vehicles parked in a nearby lot were damaged, some had windows shattered and were melted. Construction equipment at the scene was also damaged. Tragically, one person was killed in the blaze that injured six others, including a firefighter, several of whom were forced to jump from the burning building. One person is still missing. The blaze, which could be observed from space, comes at a time when a number of wood-frame, multi-family residential structures have been the site of intense fires, fueled by the combustible materials in the buildings in question – most notably in Los Angeles; Princeton, N.J.; East Boston, Mass. ; Lakewood, N.J.; Weymouth, Mass. ; Haverhill, Mass. ; Waltham, Mass. ; Charlotte, N.C.; Warner Robins, Ga.; Midvale, Utah; Oakland, Calif.; Dorchester, Mass. ; Lawrence, Mass. ; East Hollywood, Calif.; Lowell, Mass. ; Waterbury, Conn., Emeryville, Calif.; St. Petersburg, Fla.; Arlington, Va.; College Park, Md. ; Overland Park, Kan.; Raleigh, N.C.; and Maplewood, N.J. There have been dozens over the last few years. 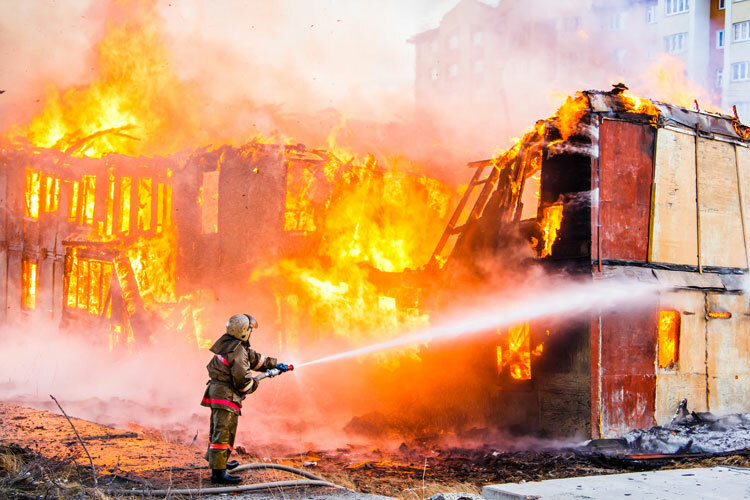 In order to address the vulnerabilities that exist in combustible structures, Build with Strength has stepped up efforts to mitigate the dangers of fire for communities across the country. In reviewing current building and fire safety codes, the coalition is working to identify areas in need of improvement, particularly in updating building codes by including the use of non-combustible materials to minimize the risk of fires.